I was honored and thrilled to give the rallying speech before the March Against Monsanto in Tucson on May 25, 2013. It was an unprecedented worldwide event with more than 2 million people protesting genetically modified organisms (GMOs) and the GM seed company Monsanto in more than 400 cities throughout the United States and more than 50 other countries. Tucson was one of the cities that participated, and between 500 and 1,000 people marched in the Tucson march – a great turnout for a very hot day in Southern Arizona! The crowd was wonderful and enthusiastic, and numerous people asked me to post what I said so they could remember it and absorb the information I covered at their leisure. 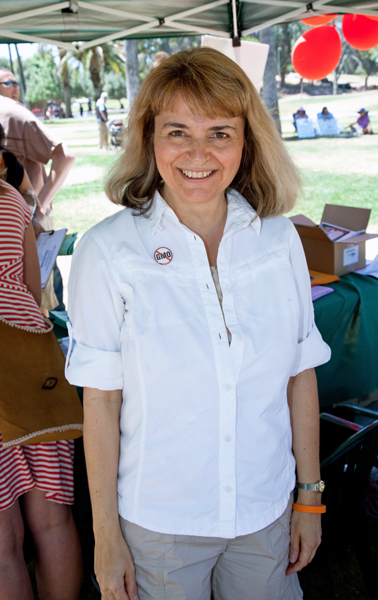 Thanks to James F. Palka/PlanetaryImages.com (PlanetaryImages.com) for this photo of me at the event and to Sean Herman for the photo at the end of this post. You can view other pictures of the Tucson March Against Monsanto here. By popular request, here’s the speech I gave.